A splash park controller is the heart and the brain of any aquatic playground, overseeing and automating all aspects of its operations. Water Splash's Eco-Conserver series of fully programmable electronic controllers are simply the most versatile and technically advanced controllers available today. Not only do they control park operations, group products by zones, set product spray sequences but can also control lightning arresters, and provide live Internet monitoring and control of the park operations. Water Splash manufactures complete water re-circulation systems at its state of the art production facilities. 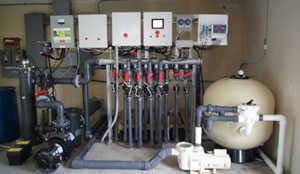 These systems employ a variety of techniques to maintain desired water chemistry levels using UV radiation treatment and CO2 and salt systems that eliminate the need to use chlorine and acid. Water re-circulation systems are fully integrated with the Eco-Conserver series of control panels and are factory assembled and tested before shipping.